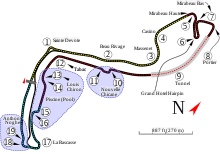 The 1997 Monaco Grand Prix (formally the LV Grand Prix de Monaco) was a Formula One race held on 11 May 1997 at the Circuit de Monaco, Monte Carlo. It was the fifth race of the 1997 Formula One World Championship. The 62-lap race was won by Michael Schumacher, driving a Ferrari, after starting from second position. Rubens Barrichello finished second in a Stewart-Ford, with Eddie Irvine third in the other Ferrari. Heinz-Harald Frentzen, driving a Williams-Renault, started from pole position ahead of Schumacher. Frentzen and teammate Jacques Villeneuve made poor starts, and both retired from the race in separate accidents. Schumacher won by some 53 seconds from Barrichello, who scored the first podium for the Stewart team in only their fifth Grand Prix. The race had been scheduled for 78 laps, but rainy conditions meant that only 62 laps were run before the two-hour time limit was reached. The win enabled Schumacher to take over the lead of the Drivers' Championship from Villeneuve, and Ferrari to move ahead of Williams in the Constructors' Championship. Heading into the fifth race of the 1997 season, Williams driver Jacques Villeneuve led the Drivers' Championship with 20 points, followed by Ferrari driver Michael Schumacher on 14. Behind them were five drivers on 10 points each: Villeneuve's team-mate Heinz-Harald Frentzen, McLaren driver David Coulthard, Schumacher's team-mate Eddie Irvine, Benetton driver Gerhard Berger, and Coulthard's team-mate Mika Häkkinen. In the Constructors' Championship, Williams led with 30 points, followed by Ferrari on 24 and McLaren on 20. Qualifying saw Heinz-Harald Frentzen qualify on pole in his Williams in front of Michael Schumacher in the Ferrari; third was Jacques Villeneuve in the other Williams. Fourth was Giancarlo Fisichella in the Jordan-Peugeot, while the fifth place was taken by David Coulthard in the McLaren and the sixth by Ralf Schumacher in the second Jordan, showing the good setup the team had found on the circuit. The warm-up session was dry, with Williams taking first and second places. But about 30 minutes to go before the start, rain began to fall; Williams decided to run both cars with dry tyres, thinking the weather would improve, while Michael Schumacher set the car for intermediate weather conditions. During the warm up lap, the weather worsened, and at the start, Schumacher was quickest. He led by 22 seconds on lap 5. Behind him the Jordans, which both had the car set for rain, took second and third spots, until they were both passed by Rubens Barrichello in the Stewart, who benefited from the Bridgestone wet tyres, which were better than Goodyear's under those conditions. The start of the race was catastrophic for the Arrows team, as Pedro Diniz, who had opted to start the race on slick tyres, slid straight into the wall on the opening lap, while Diniz' team-mate Damon Hill was involved in a collision with Mika Häkkinen's McLaren on the second lap, eliminating both cars on the spot. Both Willams drivers went out of the race after they had to pit to change their tyres. Frentzen hit a barrier at the chicane on lap 39, while Villeneuve hit a wall and had to retire on lap 17. Schumacher continued to build his lead until he had about 30 seconds advantage over Barrichello; then he backed off and began to maintain the gap. He made an error on lap 53 at the Sainte Devote corner, in which he went down the escape road and lost 10 seconds, but did not lose his lead. The race was stopped on lap 62 instead of the 78 scheduled because of the time limit of 2 hours, and Schumacher won with a 53-second margin over Barrichello. Eddie Irvine finished third after overtaking Olivier Panis, exacting some measure of revenge for Panis' overtaking manoeuvre that had seen him get past Irvine a year earlier. After losing third place to Irvine, Panis backed off in the closing stages and settled for fourth place. Mika Salo finished fifth despite denting his front wing on debris left from Mika Häkkinen's accident early on, and also despite not making a single pit stop during the race. This was the last race the feat was achieved. Giancarlo Fisichella, who at one point was running as high as second place, finished in sixth. The race was the first win for a Ferrari driver since the 1981 running of the Monaco Grand Prix. On the podium, the wrong flag was displayed for driver Eddie Irvine. The flag displayed was that of the Republic of Ireland, instead of the Union Jack of the United Kingdom. Scheduled for 78 laps but stopped after two-hour mark. Mika Salo did not make a pit-stop. First pole position for Heinz-Harald Frentzen. First point finish and first podium for Stewart. Last points finish for Tyrrell. Last Formula One race for Nicola Larini. Only time in 1997 where both Stewarts finished the race. ^ "Schumacher is simply stunning". New Straits Times. 12 May 1997. p. 39. ^ "Grand Prix Results: Monaco GP, 1997". grandprix.com. 11 May 1997. Retrieved 10 April 2013. ^ Richardson, Chris (11 May 1997). "Monaco Grand Prix 1997 - Race Report". Speed Motorsport. Retrieved 10 April 2013. ^ "Schumacher wins Monaco Grand Prix". Boca Raton News. 12 May 1997. p. 2C. ^ F1, STATS. "Monaco 1997 - Qualifications • STATS F1". www.statsf1.com. Retrieved 13 October 2018. ^ "1997 Monaco Grand Prix". formula1.com. Archived from the original on 29 October 2014. Retrieved 24 December 2015. ^ a b "Monaco 1997 - Championship • STATS F1". www.statsf1.com. Retrieved 19 March 2019. This page was last edited on 20 April 2019, at 08:52 (UTC).